Considering their name, looks, and ability to cause you immense amounts of pain, jellyfish kind of sound like something a 6-year-old made up. But jellyfish are all too real. And they will cause you immense amounts of pain, and they will look like alien poop while doing it. For instance, over 3,500 people were stung in Australia over the weekend on the Gold and Sunshine coasts in southeast Queensland. News.com.au reports that over the course of a few hours alone almost 1,000 people were stung, and several suffered anaphylactic shock. Surf Life Saving duty officer Jeremy Sturges told the publication that it was an “epidemic” -- adding, “I have never seen anything like this -- ever." The invasion is being attributed to strong northeasterly swell conditions pushing the bluebottles ashore, resulting in huge clumps along the shoreline, both on the beach and in the water. Many beaches have been closed as a precaution. 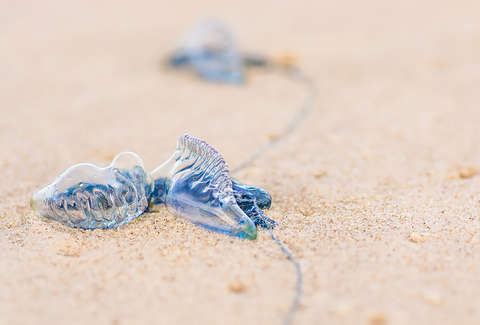 Bluebottles, also known as Pacific man-of-wars, are technically four organisms that form a colony, not a single jellyfish. While that's trippy, it's also beside the point when you've been stung by one. If that does happen, Queensland Ambulance recommended via Twitter that you "try and pick off the tentacles with a towel or other object, rinse the area with seawater, place the affected area in warm water and, if needed, apply ice packs. Avoid using vinegar if it’s clearly a bluebottle sting." But we here at Thrillist recommend not getting stung at all.